The Schedule page lists all of a project’s tasks when the project is opened for viewing or editing. The timeline on the Schedule page is a good tool for illustrating tasks at the individual project level. Tip: You can also add projects and tasks to a timeline in the Project Center to show work happening across your organization. Open the project for editing. Click anywhere on the timeline, then on the Tasks tab, in the Tasks group, click Add to Timeline. Tip: You can change the appearance of the timeline to use different colors, fonts, dates, and callouts. To add another timeline, click the current timeline, and then click Add in the Timeline Bar group on the Timeline tab. Note: Multiple timelines are available in Project Online and Project Server 2016. 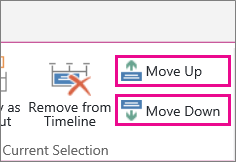 To move tasks between timelines, click the task, and then click Move Up or Move Down in the Current Selection group on the Timeline tab.